Sushi, step aside. Raw fish—Italian style—has arrived in Phoenix and local food lovers are catching the wave. It’s all happening at Crudo, an eatery in Gaslight Square serving up new Italian cuisine. 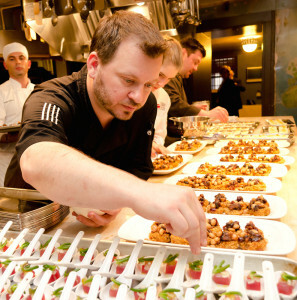 When Chef Cullen Campbell and his wife, Maureen, launched Crudo four years back, modern Italian cuisine was sweeping the country, leaving the sushi craze floundering in its wake. Crudo, meaning “raw” in Italian, is a creative fusion of Japanese-style sashimi and bold flavors found in a variety of oils, spices and seasonal local ingredients. Today you can meander into the intimate, relaxing dining space at Crudo and be entranced by a vibrant culinary experience built on the distinctive flavors of sashimi-grade fish fused with bold Italian flavors, meats seared to perfection on a custom-made wood-fired grill, fresh Italian cheeses and the highest quality, locally grown produce. One of Campbell’s signature dishes is yellowtail crudo, drizzled with olive oil, lemon juice and sea salt. The delicate dish is sprinkled with locally grown l’itois onions and Controne chile flakes, then dusted with bottarga, a finely grated dried and cured mullet row. Another standout on the menu: raw Ahi tuna paired with pistachio and horseradish. Crudo 2014 collateral captured the week of August 25, 2014 John Samora grants Crudo and it's agents unlimited usage of these images, with the exception of transit and billboard usage for the term of 3 years from the capture date. John Samora retain ownership and copyright of all images produced and retains the right to use them as he sees fit for self promotion. On the cooked (cotto) side, guests can enjoy precision-crafted dishes like risotto paired with squid ink, chiles, tuna and tomato; or gnocchetti served with the cruciferous rapini, charred onion and grana sugo (a fine Italian sauce). There are plentiful grilled (griglia) dishes to tantalize the tastebuds and flavorful cheese (mozza) plates featuring fresh-pulled mozzarella paired with exciting flavors like bacon relish and caramelized onion. For brunch seekers, Crudo serves up savory dishes featuring the likes of olive oil whipped goat cheese and grilled beets, smoked olives, and Campbell’s popular crispy pig ears. “We smoke them overnight and do a double fry on them, then we top them with pickled chiles and herbs,” he says. The beverage bar, overseen by award-winning mixologist and certified sommelier Micah Olson, showcases classic and modern cocktails that complement Crudo’s delectable dishes. Olson’s signature Scotch Baio blends Pig’s Nose Scotch, winter orchard peach, ginger and lemon and ginger ale. On the lighter side, Dazed & Infused blends sparkling wine, strawberry-infused aperol, fresh lime juice and passion fruit syrup. Of course, flavors speak louder than words and a sampling of Chef Cullen’s coastal Italian cuisine and bartender Olsen’s innovative cocktails is all you need to know what the splash is all about!